Most mass produced skis use a 2001 p-tex or lower. It's cheaper, softer, easier to work with, and they can make more money from you. I use 4001 because it is just a better product. It's harder, faster, and I'm making sure my customers get the best product, at no extra cost to them. Makes sense to me. Ski edges are what help you turn on those east coast slopes. in Colorado there wasn't much sharpening being done to the edges. Made from L-shaped extruded steel, the edge consists of a 2.2mm square spine with T-shaped flanges that are stamped out. This T-shape creates a large bonding surface for the epoxy to grab a hold to. My edges are also sand-blasted to help with bonding. VDS Rubber: Also known as Rubber Foil. You'll read about ski companies putting rubber into their skis to take the vibration out of them. Sure, it does that, but what it's really in there for is to aid with the bonding of the metal edge to the fiberglass. My edges are sandblasted with VDS for extra security. I've done cores with poplar and ash. These are good cores, and commonly used in the industry. But I have actually switched to using bamboo, and all I can say about bamboo is: FUN. They are snappy and lively. If you haven't tried a bamboo core its a must! 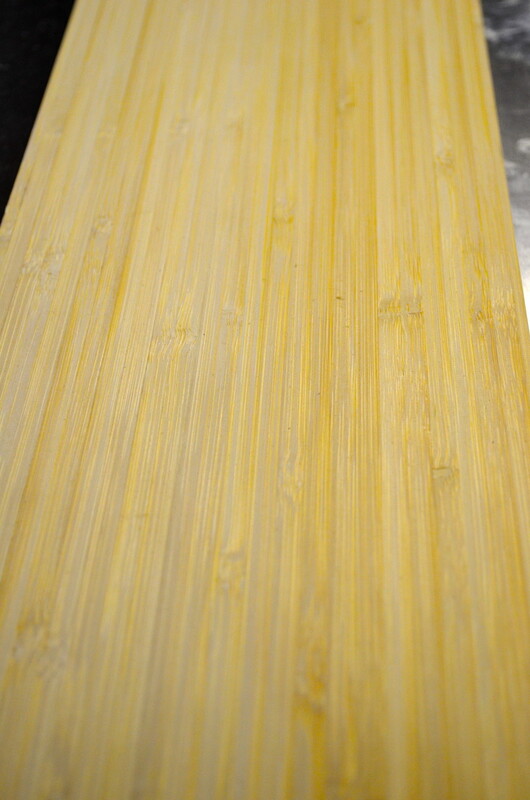 Of course, poplar and ash is still an option if your heart is set on it, but I wouldn't recommend it after trying bamboo. This is what makes a ski have its stiffness and rigidity . It comes in different weights, but I mainly stick with just one weight. In this photo you can see two different patterns. The top pattern is running in the longitudinal direction and bottom runs in 45 degree of the longitude (top and bottom of fiberglass). Orientation of the "top" and "bottom" of triaxial fiberglass can play a major factor on the behavior of the ski. Yummm Carbon Fiber! It makes the ski have so much spring. Today's market skis use only metal or fiberglass. Once the carbon is locked in the ski and you try to flex the ski the carbon really doesn't like that and tries to return to its original position. Think of a bow. Lots of snap! This is what a custom ski is all about! TopSheet: White Nylon 8103 with felt backer. My good buddy Paul does all the design work for me, the guy is crazy talented. He can design just about anything, the sky is the limit on what he can put on the top sheet of a ski. If you want your dog on a pair, half naked photo of your wife, or a crazy design like the one below; let me know and we'll see what Paul can come up with. Once the picture is completed, I send the file out to Washington to have it printed. Super SAP CPM is specifically designed for compression molding processes of composite parts. CPM has excellent fiber wetting qualities and thixotrophic characteristics to limit sag in high temperature cure applications. The best part of making skis with this epoxy is my shop smells like "roasted peanuts" when I'm pressing skis. No respirators needed during my ski production! Do the skis that are made in China use a good resin? Depends on what your definition of "good" is. Their resin is as hard as nails but that comes at such a cost. China has no environmental regulations so they don't care how bad their resin is on the environment. Just keep this in mind when buying foreign products. Besides, I think mine is just as hard but WAY better on the environment. Okay this thing is a beast. You can't really appreciate the size of it until you see it in person. Each beam weighs in at 325 lbs. The connection pieces between the top and bottom weigh in at 110lbs. The casters were made by a company in Alaska. Try finding casters that are made in the USA, it was nearly impossible. I had some China made ones, from an old tool, that were rated for 1000lbs each and the press flattened them. I guess China can't hold up to American awesomeness. ;-) Total dry weight without top/bottom mold, cat track and air bladder: 1640lbs! I can comfortably press at 70,000lbs per square inch. To put that into perspective, i've flattened golf balls in this thing.